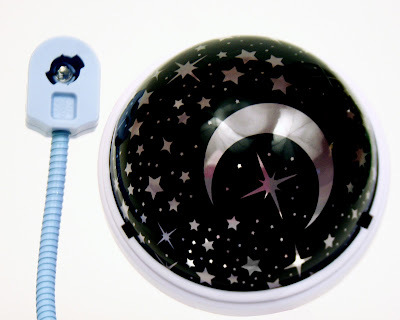 Toys As Tools Educational Toy Reviews: Review and Giveaway: SolPals Moonbeams Flower or Star: Make Every Night "Earth Night"
Is this your kid? As long as the element of curiosity is in the equation, I am not allowed to rest. Once he got really curious about window blinds and I found him later that day with thin line-shaped burn marks that spiraled around his neck. I guess he did manage to extricate himself but still!!! UGH! Occasionally, things like that happen here. I know there are safety guards for various hazards but really... many curious kids can use whatever gift they have to get around them. 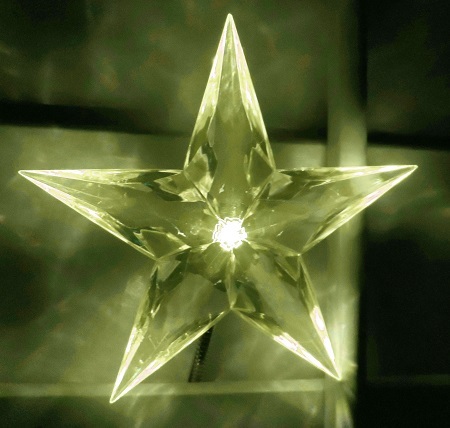 This is the star attachment that you can order instead of the flower. I am not sure if they have this color. I think they do have a blue LED for this. So why am I talking about a safety product today? 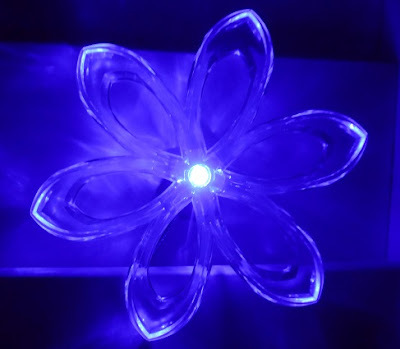 Because today is Earth Day and this Moonbeams Flower called a "solar-powered hybrid utility light" gives us the promise that we will be using the rays of the sun to power our children's nightlights. The light has a rechargeable battery inside that we never touch but we can put in two AA batteries as back up for a cloudy day. 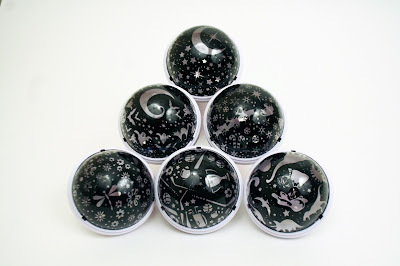 In truth, I wanted so badly to have an "Earth Day" review that I begged SolPals to send me their product as quickly as possible and so I only had a chance to test it for a few days. But I have been told that our Moonbeams Flower will likely not need a battery change more than once a year and I don't know... I just have a feeling that you all want to know about this now and not next year. So this is a part-review and part-invitation to you to test this product with me. I have a feeling that if all goes well, it will be a WIN-WIN-WIN-WIN (4 total) product. You don't have to unscrew it to put in fresh batteries. You just slide and push down the solar panel. Screws never deterred my kid anyway, they just annoy me because my kid has managed to misplace all of our screwdrivers. Irregardless of the reliability of the technology, your nightlight is supposed to be placed way out of your kids reach. 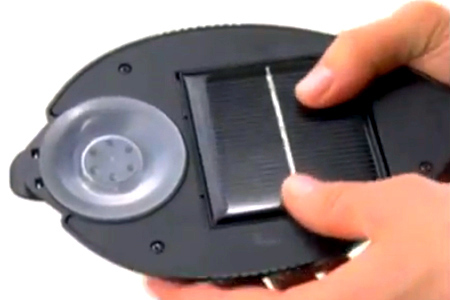 The suction on the solar panel/battery part is SO powerful, you won't be able to pull it off easily anyway. If your kids try to take it down, they will have to be on very stable footing because they won't be able to just pull it off. If they do manage to get at it, the amount of force they need to use may signal to them that they could break it and they may just stop trying. But really, the safety part is that THERE IS NO PLUG so you don't need an outlet at all. I don't need to test this for many months to see that. 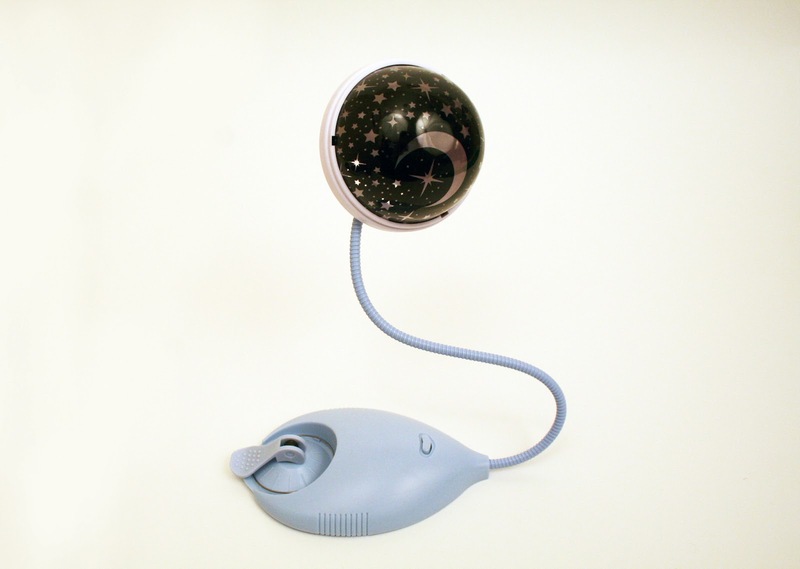 Your child may never show interest in the nightlight and outlet until one day, they are interested. To this day, I have no idea why my son suddenly becomes interested in something like the blinds which had remained unappealing to him for five years. You can see, it's quite simple. It's not heavy but the coiling/bending part is very sturdy. Still, the suction is very strong. It holds up well here. Projector is made of plastic, not glass. What do you for Earth Day in your home? I don't know about you but I never grew up with "Earth Day." One day in college, it was Earth Day all of the sudden. People were giving out free stuff in the street. That was Earth Day at NYU circa 1990. I love the earth and I try to recycle as much as possible but my kids end up teaching me more about energy conservation these days. But now I have this product so now I'm the cool guy in the fam. I told my kids that we will have no more nightlights. In honor of Earth Day, we will have moonbeam flowers or dinosaurs of light parading on our ceiling. I think this deal is more than fair. Mini-win #2: My youngest son's nightlight was way too bright! SolPals was perfect for him. He's been going to bed earlier now! Like I said, I have one curious kid. He has broken every single flashlight we have ever owned. If we had a blackout, we'd have to resort to candles because this child LOVES taking stuff apart. Thus, my husband and I have given up buying flashlights for the home. We have one in our car because that is the only one to which he has no access. If you need an emergency light, you (not your kid) can just remove it from the wall. (I use a thin ruler to break the suction) and you have a back-up light that you can put anywhere you can put a suction cup. Earthy-friendly technology does not mean the abandonment of technology. It just means better technology. I suppose it would be more fair to say that this is a "pending win" because I can only prove this claim after I've used the Moonbeams Flower for several months without having to change the batteries. Why put in batteries at all? Because some days are just cloudy. It happens. Earthy-friendly technology does not mean the abandonment of technology. It just means better technology. SolPals is a nice example of good technology becoming great technology when you use science to solve problems without making more problems. 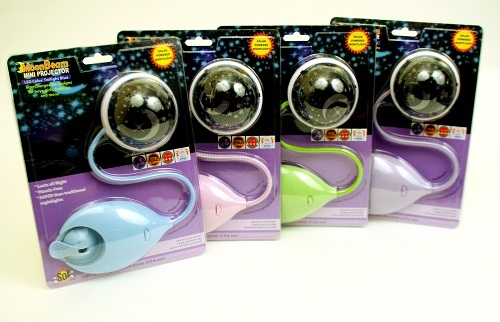 I wish I could have a few NQP (not quite perfect) SolPals lights for my son to be able to tinker with for fun or for a science project. I know that there are a lot of solar kits but I prefer to have something functional for daily use rather than a toy. I think kids could become proud of themselves when they make a contribution to their home or community. They don't forget those experiences that easily. In case your kid got bored, there IS variety... 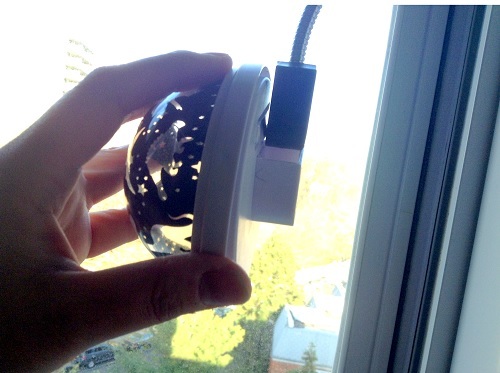 I wonder if there is a DIY projector dome that SolPals could sell. That would be really cool. Other tech plusses? Well, the light is sensitive to light meaning it won't turn on when there is still light out. You can leave on if you want because it will shut off during the day without you climbing your walls. Cool! Another tech plus is that the suction is so strong but it is rather simple. 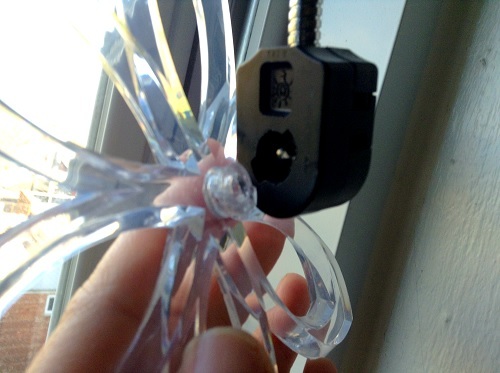 My son did manage to pull the light off the window (I told you he was curious). Like I said, the amount of force needed to yank this off is huge and so he felt really bad after he did it. But then again, I should thank him because at first I thought he had broken it. The suction mechanism had come apart but I found that the design seems to allow for this to happen and so putting it back together (good as new) is super simple, like snapping two LEGO bricks together. In fact, we thought we lost one part for a while and we fixed it easily with a LEGO piece. If anything survives this household, it means Moonbeams is hard to break. Thus even though I haven't been able to test it for months, I think there are so many lessons and so many positive statements being made here, it's a WIN for you just to try it out. Winner chooses color. Wouldn't this make a neat baby shower gift? Happy Earth Day everyone. Hope your area is as sunny as it is in New York City today! More questions? Check out their FAQ page. Happy Day of Earth everyone! 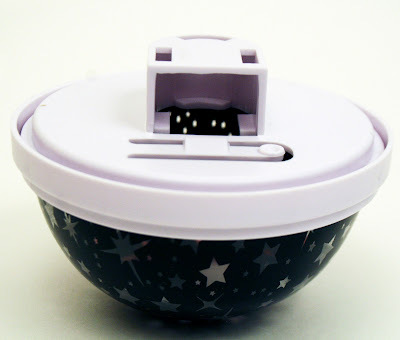 And now here's your chance to win your very own SolPals Moonbeams Mini-Projector! How cool is this??? Just fill out the Rafflecopter form below! We currently use LED Color Changing Night Lights. Earthday product: We have solar print paper which the kids can use the sun and items from nature to make prints. 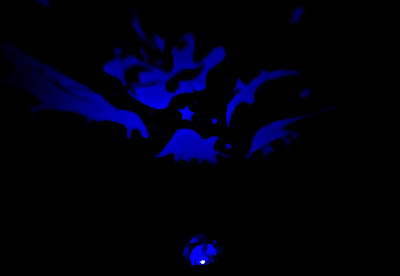 Nightlight: We use the Ikea nightlights, plug in at the wall, and the hallway light. These are so cool and such a great way to let kids see solar power in action.